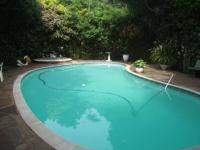 This is Property For Sale in South Africa that is well worth a look. A well established South Coast Guest House which has come on the market and shows the value of South African Real Estate. A South Africa Property Investment to utilise as a Guest House with a viable turnover or as a family home of note. Situated in the coastal village of St. Michaels -on -Sea halfway between Shelly Beach and Margate you are close to the major shopping centres and the popular swimming beaches. See what I mean. South African Property Investment is hard to beat. The outdoor lounge is just the place for relaxing and watching the ships go by or being entertained by the activities of the resident swallows that nest on the terrace. Here the sun rises above the sea to the sounds of waves and many different wild bird calls. 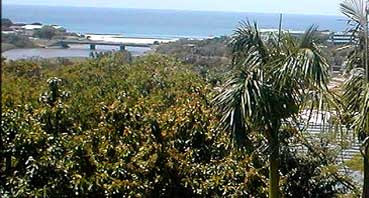 Breakfast is s erved on the terrace over looking the sea where dolphins and whales can be spotted. Take a stroll or a quick drive to St Michaels beach or relax by the pool surrounded by palm trees in the tranquil, tropical garden. For those who really want to be pampered aromatherapy, reflexology and Swedish massage sessions can be arranged in the privacy of your own room. There are many excellent restaurants in the area but if you prefer to stay in the comfort of the lodge, light lunches and delightful dinners are served by arrangement. There is ample and secure parking. Visa, Master and Diners Club cards are accepted. A laundry service is offered. Both English and German is spoken by your hosts. Children are by arrangement only. Also known as the Golf Coast, there are some top class golf courses in close proximity. A game of golf can be enjoyed at Selbourne, San Lameer, Southbroom, Wild Coast Sun, Port Edward, Port Shepstone and Margate. The Lodge is 4 star graded with the Tourism Grading Council of SA and Portfolio accredited. 8 bedrooms and 7 bathrooms. Stylish and comfortable. Beautiful beaches at Margate St.Michaels Uvongo Southbroom, Ramsgate. 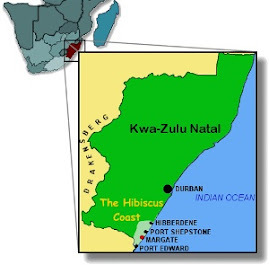 Golf Courses at Southbroom San Lameer Wild Coast Selbourne, Umdoni, Port Shepstone, Margate. All in all it is not hard to sing the praises of this Property For Sale in South Africa. 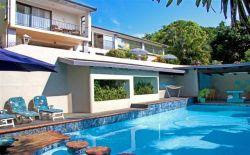 South African Real Estate offers extremely good value , especially if you are buying with overseas currency. South Africa Property Investment enables you to live a life of comfortable luxury coupled with an excellent return on your investment.